Fish oils are an important natural remedy for general depression and can be very helpful in a natural postpartum depression treatment plan. Here are some tips for choosing fish oils that will give you the greatest benefits. If you have been supplementing with DHA during pregnancy and are still having symptoms of postpartum depression, then you may want to increase your dosage and switch to taking a higher amount of EPA versus DHA. During pregnancy, DHA is usually taken in higher amounts than EPA for the baby’s benefit. For relief from depression, however, EPA fatty acid is more effective as a natural antidepressant. Liquid Fish Oil or Capsules? Some women experience a noticeable improvement in mood as soon as one hour after starting high dose fish oil supplements. From my experience, I think that the most benefit comes from taking fish oil in liquid form instead of capsules, especially when you’re trying to quickly affect postpartum depression or general depression. If you take a smaller amount and lengthen the time of digestion through encapsulation, the effect occurs more slowly, and you may feel discouraged with the treatment. Liquid fish oils have a strong taste, but you can chase it down with citrus juice. Some brands, like Pharmax Finest Pure Fish Oil, add orange oil to obscure the fishy taste. Start with the liquid form for an intensive rejuvenating time of one month. Then transition into a maintenance phase and switch to less fishy-tasting capsules. For many though, the liquid is too hard to take and so capsules are the next best thing. Take with or without food, separated in two doses. Or if you forget, just take them all at once. The total omega-3 fatty acids dosage most recommended in the treatment of depression is 3,500 mg total omega-3 per day. Per serving, the product you choose should have both EPA and DHA, but with a higher amount of EPA. It should not have a significantly reduced amount of DHA, though. Aim for a ratio of 500 mg or more EPA, and around 300 mg or more DHA per serving. 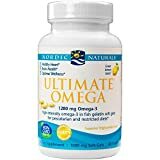 For example, Nordic Naturals Ultimate Omega contains 650 mg EPA and 450 mg DHA per serving (two capsules contain 1,280 mg total). You would want to take twice the serving size, or 4 capsules, of this brand to get close to the recommended daily dosage of 3,500 mg for depression. Remember, we are each unique in our chemistry, so your body may need more or less than another woman’s body.